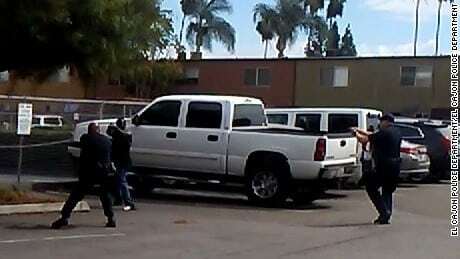 A new video just released by the El Cajon, CA police department shows the death of a black man who was pointing a vape at officers, pretending that it was a gun. The man, Alfred Okwera Olango, reportedly suffered from mental illness. Police arrived on the scene after his sister called them to report that he was “not acting like himself”. He ignored multiple instructions from a pair of officers, and then “concealed his hands in his pants pockets”. After pacing back and forth, Olango “rapidly drew an object from his front pants pockets, placed both hands together on it and extended it rapidly toward [one] officer, taking what appeared to be a shooting stance.” He pointed the object at an officers face and the officer shot and killed him with a handgun. Later on it was determined that the object was a “vape smoking device” (ugh). It’s unknown exactly what type of vaporizer he was pointing at the officer. Of course, since the victim was a black individual, those scumbags from Black Lives Matter took to the streets to protest and block traffic in San Diego. While some police officers may indeed be assholes, this seems like a case where a mentally ill person did something crazy and paid the price. It’s unfortunate but if the police officers are telling the truth, then they had reason to believe that he was pointing a gun at them and they did the only thing that they could do in that situation. Hindsight is 20/20. VaporVanity co-founder J.R. Reynoldson spends 364 days per year wishing that it was 4/20. He is easily offended by your comments. Email JR at c[email protected].